An inductor is a coil of wire. Passing a current through a coil creates an electromagnetic field. Most coils consist of wire wrapped around a metallic core which intensifies the magnetic field. Some coils have no core and are called air core coils. If the current flow through the coil is stable, then the electromagnetic field around the coil will also be stable. If the current is increased, the electromagnetic field will strengthen and expand. If the current is decreased, the electromagnetic field will weaken and contract. There is a fundamental law of electricity relating electricity and magnetism. If a magnetic field is cut by a conductor (such as a wire), either by moving the conductor through the field or by moving the field through the conductor, then a voltage will be induced in the conductor. This is how electrical generators work and is a key concept of induction. Varying the current flow through a coil will cause the electromagnetic field generated by the coil to change. This change, in turn, causes a voltage to be induced in the wire of the coil. The induced voltage (called counterelectromotive force) always opposes the voltage being applied to the coil (Lenz&apos;s Law). If this is a bit confusing, perhaps an example will help. Assume a steady current is flowing through a coil. The electromagnetic field generated by the coil will also be steady. Now decrease the voltage applied to the coil. The current flow through the coil will also attempt to decrease causing the electromagnetic field to contract. As the field contracts, it cuts the coil wire which induces a voltage in the coil wire that opposes the decrease in the applied voltage. In essence, the coil tries to maintain the same current flow through it by storing energy in or draining energy from its electromagnetic field. The amount of energy that a coil is capable of storing in its electromagnetic field is called its inductance value and is measured in units called henrys honoring Joseph Henry (1797 – 1878). One henry represents the inductance value generated by a current change of one ampere per second producing a counter electromotive force of one volt. The symbol for inductance is L.
The number of turns (N) in a coil significantly affects the inductance as L is proportional to N2. Double the number of turns and the inductance increases four times. The spacing of the turns affects inductance. A coil having ten turns per inch will have less inductance than a similar coil having fifty turns per inch. The size of the coil turns also matters. Coils with larger turns have more inductance than similar coils with smaller turns. The inductance varies in direct proportion to the square of the diameter of each turn. Permeability (μ) of the coil core affects inductance. An iron core coil with a permeability of 5000 has more inductance than an air core coil with a permeability of 1. The inductance of several coils in series or parallel is calculated just like resistors. In series, the inductances of each coil are simply added together. In parallel, the inverse of the total induction equals the sum of the inverses of each coil&apos;s inductance. Both equations assume no mutual inductance is occurring between coils. If you look at a graph of current versus time in a circuit with a coil, something odd appears. If the circuit begins with zero voltage applied, there will be zero current - as expected. As you apply a voltage you would expect the current to increase at the same rate but that is not what happens. As the current tries to flow through the coil, the coil begins to store some of that energy in its electromagnetic field. Thus, the measured current flow will be less than expected compared to a circuit without an inductor. The current will eventually approach its maximum value, but it will take a while to get there. 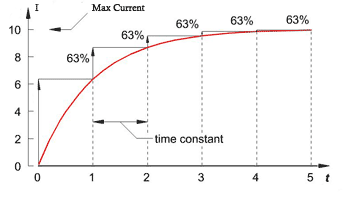 A unit called the time constant is the time required for the current flow through an inductor to reach 63% of its maximum value. The time constant is measured in seconds and is derived by dividing the inductance value of the coil by the resistance of the circuit. When a voltage is first applied to a coil, it takes one time constant for the current to reach 63% of the maximum current. During the next time constant interval, the current will increase by another 63% of the difference between its present level and the maximum level. In the time constant period following that, the current will increase another 63% of the difference, and so on. Since it is always increasing by only 63%, in theory, the current will never quite reach the maximum current level - just get closer and closer to it as time stretches to infinity. The graph of current through an inductor versus time reveals an exponential function. In practice, the coil is considered to have reached maximum current after five time constant periods. A plot of the voltage and current for a purely inductive circuit (consisting of only an AC source and an inductor) is shown below. You can see that the current is out of phase with the voltage. This is due to the coil storing some of the electrical energy in it&apos;s electromagnetic field. This phase difference is called the phase angle and is stated in degrees. The diagram shows the phase angle for a purely inductive circuit is 90°. The current will always take time to catch up to the voltage and this effect is called current lag. Current lag caused by an inductor makes calculating the power in a circuit more complicated. If you use the power equation from an earlier tutorial, P = IE and plug in the root mean square values for the voltage and current, you get the apparent power of the circuit. This value does not take the current lag into consideration. To find the true power, multiply the apparent power by the cosine of the phase angle. The quotient of the true power divided by the apparent power is called the power factor. In a purely resistive circuit (with no inductor), the current and voltage are in phase with each other and the phase angle is zero. Since the cosine of zero is one, when calculating true power in a purely resistive circuit you can ignore the phase angle and just use the simpler formula P = I × E.